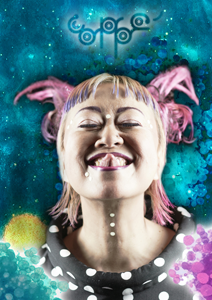 Hailed as the ‘Godmother of Japanese Electronica’, Coppé has paved her own unique creative path over the years. Even from an early age, Coppé had a desire to pursue music. From the age of three she studied classical piano and also won a Nihon Record Taisho award for her song Peke No Uta. From there she embarked on regular TV appearances which later resulted in presenter roles on both radio and TV. Meanwhile, Coppé was still pursuing her own music dreams and released her first album in 1995 on her own Mango + Sweetrice label. Her music weaves in a variety of sounds and influences to produce unique electronic compositions. She’s also collaborated with a wide variety of musicians including Kris Weston (ex-Orb), Plaid, Q-Bert, DJ Vadim, Nobukazu Takemura, DJ Kensei and Hifana amongst others.